New Age Metals Completes Mineralogical PGM Report and Lithium/PGM Division Updates – New Age Metals Inc.
First round of mineralogical test work completed at Expert Process Solutions (XPS) Sudbury, Ontario. Four composite samples were created from typical grade Pine Zone, high-grade Pine Zone, typical grade Dana Zone, and high-grade Dana Zone from existing samples. This program focused on both Platinum Group Metals (PGM) and base metal mineralogy, using QEMSCAN, EPMA, and LA-ICP-MS technologies to characterize the samples. The overall results of this program were positive and will help advance the River Valley PGM Project towards our proposed Preliminary Economic Assessment (PEA). River Valley is the largest undeveloped primary PGM resource in Canada, with 4.6 Moz PdEq in Measured Plus Indicated including an additional 2.6 Moz PdEq in Inferred. The River Valley PGM Project has excellent infrastructure and is within 100 kilometers of the Sudbury Metallurgical Complex. The project is 100% owned by New Age Metals (see news release dated March 21st, 2018). Ground IP geophysics has recently been completed and tested the footwall regions of the T4 to T9 anomalies. The report is expected by end of April. 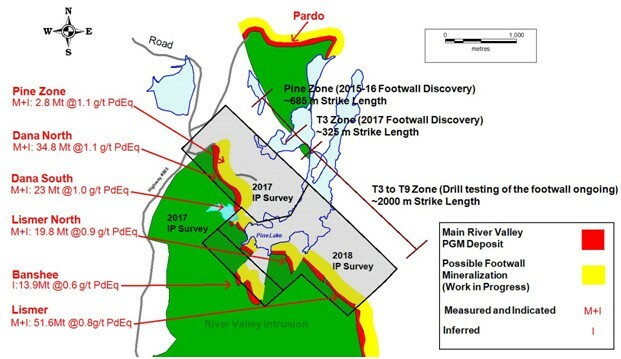 Footwall PGM mineralization is a new and additional source of PGMs at the River Valley project (see Figure 1 & 2 in the body of this press release). Lithium Division: As field manager, NAM is currently preparing for the spring/summer exploration program where a minimum of $500,000 is to be expended in 2018 on the company’s five Lithium projects in Manitoba (see news release dated January 15th, and February 22nd, 2018). The 2018 budget will allow for 2 out of the 3 drill ready projects to be drilled. A mineralogical analysis has been completed on four composites from New Age Metal’s River Valley property. The composites were created from existing samples and include typical grade Pine Zone, high-grade Pine Zone, typical grade Dana Zone and high-grade Dana Zone. The work focussed on both Platinum Group Metals (PGM) and base metals mineralogy. QEMSCAN (Quantitative Evaluation of Materials by Scanning Electron Microscope), EPMA (Electron Probe Micro Analysis) and LA-ICP-MS (Laser Ablation-Inductively Coupled Plasma-Mass Spectrometry) were utilised to characterise the samples. Total Nickel (Ni) that occurs in Ni sulphide (pentlandite and trace siegenite) range from 40% (Dana) to 50% (High Grade Pine), with the remaining occurring in Fe sulphide and Mg silicates. Future flotation testing focusing on recovery of Ni sulphide has the potential to increase Pd recoveries by 2-3% over previous testing, based on Pd in solid solution alone. The main PGM minerals are Kotulskite, Pd(Bi,Te), Isomertieite, Pd11Sb2As2 and Sperrylite, PtAs2. Kotulskite is more common in the Pine Zone than in the Dana Zone whilst Isomertieite was identified in higher quantities in the Dana Zone. Based on a grind target of 75µm, PGMs are well liberated: 75% in the Dana Zone and 51% in the Pine Zone with grain sizes ranging from 2µm up to a maximum of 50µm. Grain sizes of PGMs locked in silicate gangue range in size from 1µm to 15µm. Silicate mineralogy in all samples consists of actinolite, feldspar, chlorite, biotite, quartz and epidote. Pine Zone samples contain higher levels of epidote and biotite compared to the Dana Zone. Epidote, which occurs as an alteration in Sudbury ores, is often associated with Cu mineralization. Recently a second phase of ground IP geophysics has been completed on an area south of the Pine Zone and over the T4 to T9 target anomalies (Figure 1). The new survey area represents a strike length of approximately 2000 metres. The final report from Abitibi Geophysics is expected by mid-April. When completed, it will be sent to our Sudbury geophysical consultant Alan King who completed a previous compilation of our past geophysical programs in late 2017. Based on the recommendations of Abitibi and Alan King, the company will outline a series of drill programs to test the new geophysical anomalies generated from the survey and outline additional drilling in the Pine Zone through to the T9 areas. The geophysical survey was a high-resolution OreVision® IP survey, which can reveal targets at four times the depth of conventional IP without compromising near-surface resolution. Figure 1: Northern Portion of the River Valley PGM Deposit Showing Regions of Current IP Geophysics. NOTE: Image only represents approximately 3.5 km of the overall strike length of the River Valley PGM deposit. Complete mineralogical studies (Q2 2018). Continue to advance the River Valley PGM Project towards a Preliminary Economic Assessment (PEA) on the River Valley PGM Deposit. Our corporate mandate for the River Valley PGM Project is to build a series of open pits (bulk mining) over the 16 kilometers of mineralization. We will concentrate on site and ship the concentrates approximately 100 km to the Sudbury Metallurgical Complex. Figure 2: The Yellow Band represents the interpolated footwall potential area of the River Valley Deposit based on the results of the Pine Zone where footwall mineralization was noted to extend 150 meters eastward from the main deposit. At present the only area that has confirmed footwall mineralization is in the Pine Zone (defined from 2015 to 2017 drilling). Exploration is in progress to test other areas of the deposit. 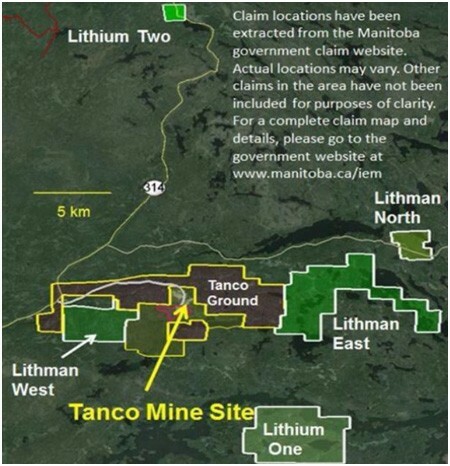 The Company has five pegmatite hosted Lithium Projects in the Winnipeg River Pegmatite Field, located in SE Manitoba. Three of the projects are drill ready. This Pegmatite Field hosts the world class Tanco Pegmatite that has been mined for Tantalum, Cesium and Spodumene (one of the primary Lithium ore minerals) in varying capacities, since 1969. NAM’s Lithium Projects are strategically situated in this prolific Pegmatite Field. Presently, NAM is one of the largest mineral claim holder for Lithium in the Winnipeg River Pegmatite Field. On January 15th 2018, NAM announced an agreement with Azincourt Energy Corporation (see Jan 15, 2018 and Feb 22nd, 2018 Press Release) whereby Azincourt will commit up to $3.85 million dollars in exploration, up to 3 million shares of Azincourt stock to NAM, up to $210,000 in cash, and a 2% net smelter royalty on all 5 projects. Two field manager meetings have been held and exploration plans for 2018 are currently in progress for the spring and summer. Figure 3: Location of NAM’s 5 Lithium Projects in Southeast Manitoba. Presently, NAM, with its option/joint venture partner Azincourt Energy Corp. (AAZ), are one of the largest mineral claim holders in the Winnipeg River Pegmatite Field. On April 4th 2018 (see April 4th, 2018 Press Release), NAM signed a binding Letter of Intent (LOI) with Avalon Development Corp. This agreement will allow NAM to acquire projects in the State of Alaska. Under the terms of the LOI, Avalon will be providing NAM with its extensive geological, geochemical, and geophysical database on PGM’s, PGM Polymetallic, and Rare Metals for a minimum of 2 years. Additionally, the agreement states that Avalon will act as the field manager for any future projects as well as they will receive a finder’s fee and/or property option compensation for its services. In January 2018, we received a second detailed analytical report conducted by Siddharth Rajeev of Fundamental Research Corporation. The FRC report is currently available to view on www.newagemetals.com for further information please email Paul Poggione in Corporate Development at paulp@newagemetals.com or call 613-659-2773. In addition, the Company announces that it has granted 150,000 incentive stock options to directors, officers and consultants of the Company at an exercise price of $0.14 per share for a period of five (5) years from the date of grant in accordance with the Company’s Stock Option Plan. The Stock Options granted will be subject to vesting restrictions and will vest over a period of one (1) year from the date of grant. The options are subject to acceptance by the TSX Venture Exchange and will be subject to regulatory hold periods in accordance with applicable Canadian Securities Laws.